This Corridor Travel Time page gives user a quick overview of the real-time travel times on different corridors in Las Vegas Metropolitan area. It also enables the users to create their own route to get their own travel times. This page is updated every minute with the latest update timestamp on the top. On this page, the left pane is the corridor/sub-corridor list, with the real-time average speed and travel time. 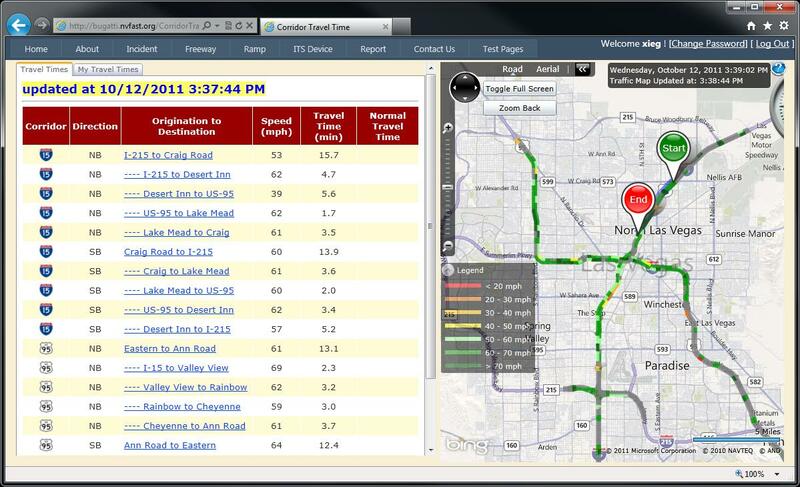 The right pane is the interactive map showing the live traffic map. If the user clicks on the corridor, it will zoom and center the map to this corridor with "Start" and "End" drop pins indicated. · Click on the hyperlink of the corridor/sub-corridor will zoom and center the map to the corridor. The corridor is defined by the "Start" and "End" drop pins. · Users can define their own route, and this Dashboard will show their route travel time. · Users can right click on the segment to select the "Start" or "End" point directly from the map. · User can also select the OD pair from the "Origination and Destination Selection Panel". · User can add this route into the user-defined route list, or just view it on the fly.